Holly Moyer (left) and Kitty McMahon sort through books to find the best of the best. The Friends of the Carlsbad Library volunteers are busy lately sorting and pricing books in preparation for the group’s Spring Better Books Sale, according to Publicity Chairman Tiffany Porter. The sale is set for May 1-2, 2010 in the Community Room of the Georgina Cole Library, 1250 Carlsbad Village Drive. It will feature the best of the best – hundreds of like-new volumes that have been culled from donations to the Friends of the Library used book store throughout the year. . . . “These books deserve a special look,” said Marianne O’Leary, coordinator of the event, as she prepared items for the sale, assisted by volunteers Kitty McMahon and Holly Moyer. Without giving too much away let us say this: we know there will be some amazingly good books in this sale because we nearly cried when we dropped some of them off. For more information on the sale follow the jump. 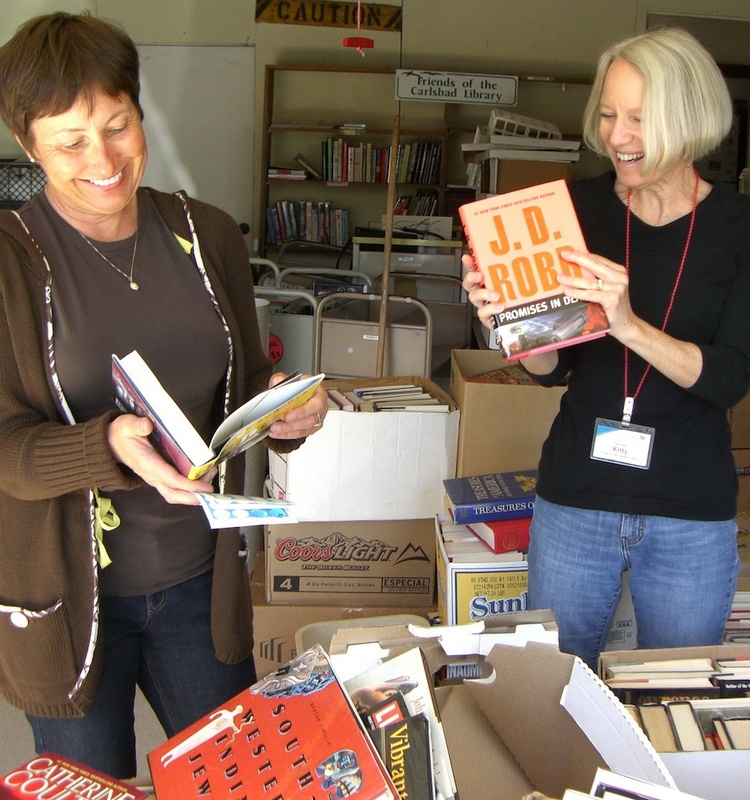 CARLSBAD – Friends of the Carlsbad Library volunteers are busy sorting and pricing books in preparation for the group’s Spring Better Books Sale. The sale is set for May 1-2 in the Community Room of the Georgina Cole Library, 1250 Carlsbad Village Drive. It will feature the best of the best – hundreds of like-new volumes that have been culled from donations to the Friends of the Library used book store throughout the year. “These books deserve a special look,” said Marianne O’Leary, coordinator of the event, as she prepared items for the sale, assisted by volunteers Kitty McMahon and Holly Moyer. The event will offer hundreds of coffee-table books and other fine volumes at a fraction of retail price. They include books on art, nature, photography and history, as well as a variety of graphic novels and hardback copies of recent best-sellers. If the turnout is like that of past years, O’Leary said, people will be lined up outside the door when the sale opens to get first choice. Sale hours are 9 a.m. to 4:30 p.m. Saturday and 1 to 4 p.m. Sunday. Proceeds from the event go toward the purchase of library books and materials and help fund library programs, such as the Summer Reading Program for children and Carlsbad Reads Together, the annual community-wide reading event that takes place every April. In addition to hosting special sales throughout the year, Friends of the Library volunteers staff the bookstore at the Carlsbad City Library, 1775 Dove Lane. They also offer used books and magazines for sale at the Georgina Cole Library. People can donate books and magazines they no longer need by bringing them to the check-out desk of either library or by placing them in the donation bin near the Dove Library’s service entrance on the south side of the building. Some donated items go into the library’s collection, while the rest are sold by the Friends, who raise more than $100,000 a year for library programs and materials. I just missed your spring used book sale. Can you please tell me when the next one will be?